In 1938‑39, the U.S. Army Air Corps began to realize just how far behind the international standards U.S. military aircraft design had fallen. The Seversky P‑35 was only just attaining operational service, and anyone who compared its performance with what was known of the German Bf‑109 and the British Spitfire and Hurricane could see just how far behind the U.S. was. The result was the creation of some fairly daring requirements, which resulted in such operational aircraft as the P‑38 ‑ the only US single‑seat twin‑engine fighter to see service during the Second World War ‑ and the P‑39, which introduced a novel position for the engine that allowed installation of a heavy nose armament. This period of aeronautical adventursomeness also resulted in some major failures, though these aircraft would be quite interesting in their design philosophies. In February, 1940, the Air Corps issued Proposal R-40C, which called for a new fighters with a top speed of 525 m.p.h. at 15,000 feet, and a proposed armament of two 20mm cannon and four 50-caliber machine guns. Curtiss, Vultee and Northrop responded to the proposal with three very different yet essentially-similar aircraft. The pusher fighter concept had been around since 1915. The advantage of the design was it allowed a heavy armament on the centerline, though the use of booms for the tail unit made the resulting airplane more fragile than the traditional tractor designs. Use of modern aeronautical knowledge gave the promise of higher performance than traditional designs. One, the Vultee XP‑54, was the most traditional, with a central nacelle holding the cockpit and engine, with tail surfaces supported by booms to either side of the propeller arc. The other two were more radical, these being the Curtiss XP‑55 and the Northrop XP‑56. The XP‑56 got around the tail boom problem by being "tailless," in a design similar to that of the Messerschmitt Me-163, though with a different power plant. The design rested on Northrop's experience in designing a successful flying wing, though this would differ by having a central nacelle for installation of the powerplant and cockpit, while dispensing with tail surfaces completely in favor of Northrop's elevons. The outer wing was canted down, as was the case with the original N1M flying wing. At the time of the design of the XP-56, flight testing of the N1M had not yet revealed the control difficulties associated with this element of the design. The XP-56, nicknamed "The Black Bullet," has powered by a Pratt and Whitney R-2800 providing 2,000 h.p. through contra-rotating propellers that cancelled the torque and yaw associated with propellers turning in the same direction. The aircraft was built of welded magnesium to save weight. The first prototype, 41-786, made its initial flight at Muroc Dry Lake (today's Edwards AFB) on September 6, 1943. It made three more flights before the nosewheel strut collapsed during high-speed rollout from the fourth flight on October 8; the aircraft was later scrapped due to the extensive damage it suffered. The second prototype, 42-38553, incorporated several changes as a result of flight experience of the first prototype, the most noticeable being the increase in vertical fin area to improve in-flight stability, and blown-air jets mounted on the wingtips for directional steering, since the flying wing system of "elevons" had a tendency to "hunt" as regards directional stability. The second XP-56 took off from Northrop's Hawthorne field on March 23, 1944. Nine more flights were conducted, the last on August 11,1944, before the program was cancelled. Flight test of the XP-56 had demonstrated the design was not sufficiently maneuverable - a problem that had been revealed in the testing of the N1M, that might have been cured by deleting the "crank" in the outer wing. Additionally, the airplane was nose-heavy, which resulted in difficulty handling it during take-off, and was severely underpowered. By this time, the success of the first generation of jet fighters had been demonstrated; the XP-56, as well as the XP-54 and XP-55 - none of which had lived up to expectations - were cancelled. 42-38553 still exists and is in storage at the Paul E. Garber Facility of the National Air and Space Museum, awaiting restoration. It is rumored this project is imminent. As with the other seven Czech Model kits, the XP-56 is a limited-run injection-molded kit with resin detail parts and a vacuform canopy. As molded, the kit represents 42-38553, the second prototype. Three sprues of dark grey plastic present 31 injection-molded parts, including six parts for the wheels, which can be replaced by the True Details resin-cast wheels, which look vastly superior. The injection parts are thick, and have numerous mold release plugs on the inner surfaces that will have to be cut off. Exterior detail is finely scribed and looks very good. 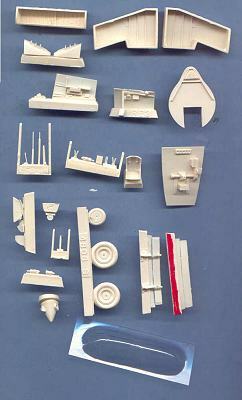 The cockpit and gear wells are in crisply-cast resin, and two very clear and well-made vacuform canopies are provided. 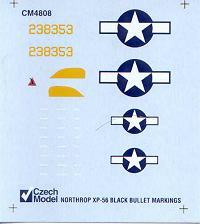 Decals are provided for the surviving XP-56. Test-fitting of the six main parts of the airframe reveals the kit is well-designed and will fit easily. You will need to sand down the main gear wells to get them inside the wing, but this should present little difficulty. I would recommend a bit of weight in the nose as a precaution against tail-sitting. 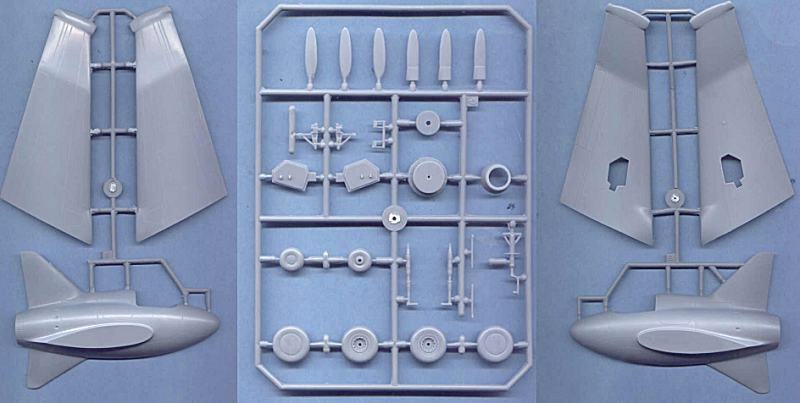 This is a simple kit that looks like it will build into a very interesting-looking model of a fascinating airplane, even if it was ultimately a failure. Those who are interested in including a history of aircraft design in their model collection will be pleased to have this sitting on the shelf. If you are new to limited-run kits, this one looks to present no real difficulties and could be the one you get started with. 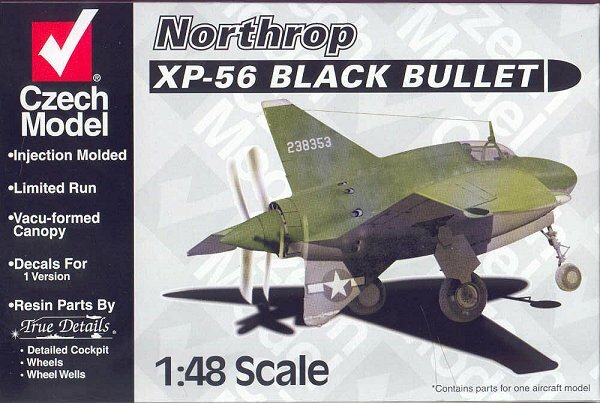 Having done the XP-55, I am looking forward to this model, and hope Squadron will complete the trilogy soon with the release of an XP-54 kit. Thanks to Squadron Mail Order for the review sample.